All right. Raise your hand if you’re in goal setting mode. Okay, I can’t see you but I’m going to go out on a limb here and say that you’re starting to think about goals for 2017 at the very least. That’s a good thing!And over the course of the next three weeks, I’m going to be coming to with a post to help you get geared up for 2017 and set goals that will not only fit you like a glove but will be in complete alignment with where you are in your business. Truthfully speaking, we often set goals that really don’t serve us. Instead, we set goals based off of what we think we need to be doing because other people have told us to do so. Or because we aren’t sure where we need to be working and growing. Creating a year end assessment will help you create better, more intentional goals for the new year! Learn how to assess your blog and business easily. And this is why a year end assessment is absolutely imperative to setting incredible goals and actually making them happen. 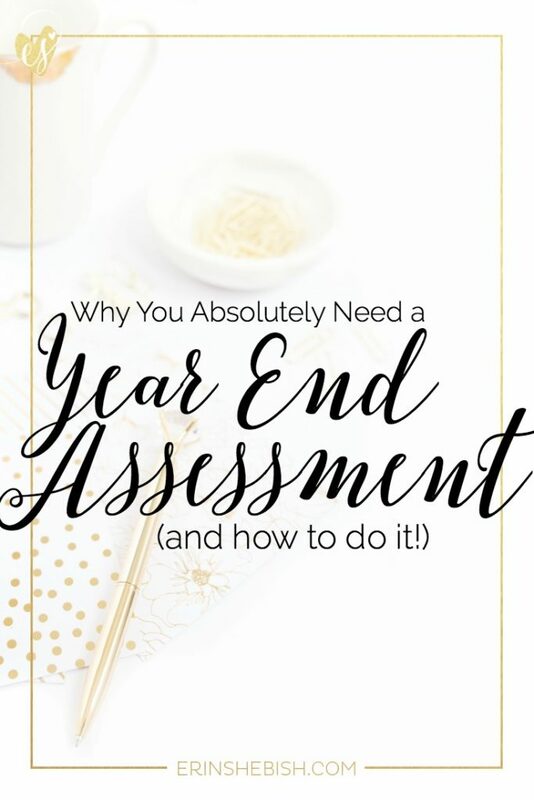 So what is a year end assessment? Great question! A year end assessment is when you look at your business over the course of the year and take note of the happenings and occurrences. Now this really isn’t a time to just skimp and breeze through. You really need to take note of specifics because learning these specifics gives you the ground you need to really take off running with you business goals. Take a look at the goals you set in the past year. If you’ve been in business for any length of time then most likely you’ve set some goals. Pull out those goals and take a look at them. Then ask yourself a few questions. How did those accomplishments serve you? Which goals didn’t you accomplish? Why weren’t you able to reach those goals? Do the goals set still resonate with you today? Are they still things that are in alignment with your business? This may feel very time consuming but trust me… it’s well worth it. Track all of your current numbers. I’ll be the first to tell you that business online isn’t strictly a numbers game. Having a bajillion followers doesn’t make you any better of a business owner than someone with 200 if you don’t have the right audience, you know? But in order to create growth, you need to have an understanding of your numbers. If you have a website, it’s time to check out your analytics. Pull up Google Analytics or whatever analytic tracking program you use and take a peek at your traffic. Take note of how many people are visiting your site. Where are they coming from? What pages/posts are being visited the most? You want to write all of that down. These are important to know because it create awareness about what your audience is really coming to you for. But it doesn’t just end with your website; you need to take social media into consideration too. How many followers do you have on each platform? What platforms do you enjoy the most or feel most like your home? Which platforms are getting the highest engagement? Are any of these platforms leading to traffic to your site or converting? Hopefully this year has been full of successful endeavors. If so, now’s the time to think about what things worked for you. What types of content generated the most traffic? Were there any opt ins that caught more attention than others? Did you participate in any affiliate campaigns successfully? What systems made your life easier? Knowing what worked in your favor in 2016 will help you come up with action plans for 2017! Ahem. So not everything goes according to plan, right? It’s time to look over the things that didn’t work. Did you try new content information that your audience didn’t respond to? What offerings didn’t work out? Programs that caused you more heartache than help? Did you implement any schedules or systems that made life harder? This is literally a time to explore those “darn it” moments when things didn’t quite pan out. You can write it all down and gain some insight from those. Now, of course, there are so many things you can go over to end your year but this is a good place to start. This will give you a solid foundation to work with. However, don’t be afraid to go even more in depth! Okay, friends. Dive into that assessment and I’ll see you back here next week to work on getting ready for 2017!